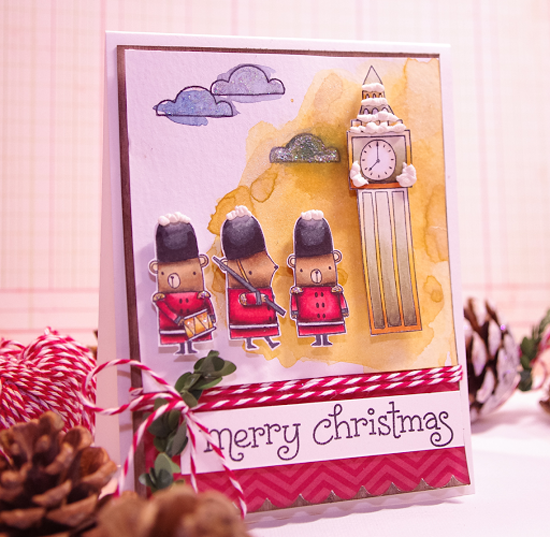 Design Team Member Teri Anderson spotted this cute winter scene by Tobi using the London Mouse stamp set. With a little bit of liquid applique, the mice and Big Ben get a snowy update. Add in some holly and red and white twine and this stamp set is transformed into a super cute Christmas card. Challenge Team Member Vera Wirianta Yates spotted Amy's card as an entry for Sketch 252 back in October. Vera says, "I love this card by Amy. Her coloring is simply fabulous." 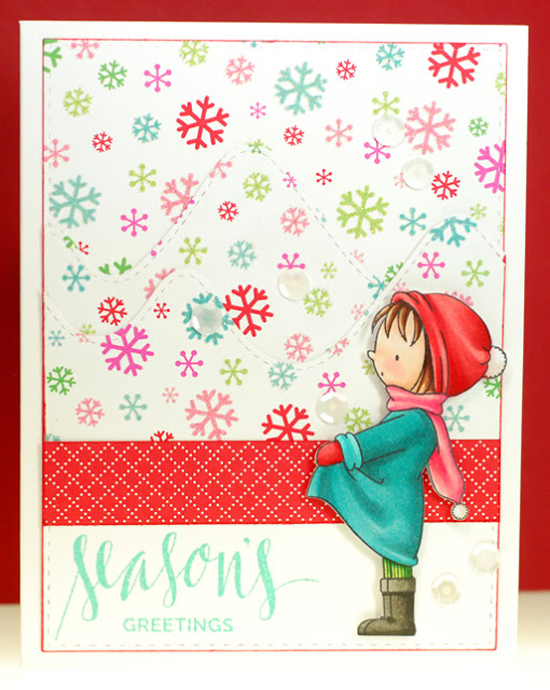 Amy pairs the adorable girl from the Warmest Wishes stamp set and the Hand Lettered Holiday stamp set for a simply sweet holiday greeting. 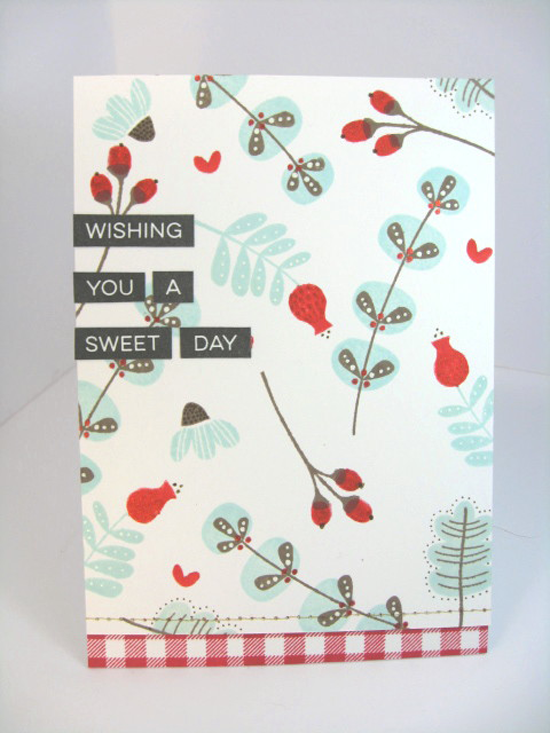 Design Team Member Kay Miller spotted this card on Pinterest and then followed the link to Flickr. Kay says, "I love the card! The colors she used are so pretty!" Kate makes our Fall Florals stamp set look Christmasey with her color choices and the little strip of gingham. So sweet! 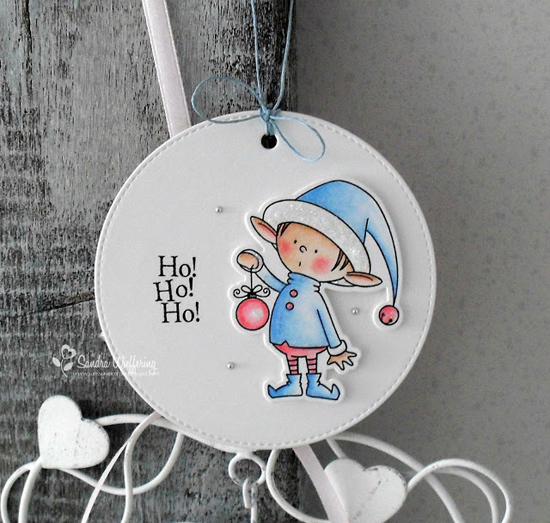 Design Team Members Donna Mikasa and Francine Vuillème both spotted this oh so cute Christmas card on Anja's blog. Francine says, "This is such a beautiful Christmas scene!" and Donna says, "Great masking, and she added the smaller moose from another Birdie Brown set for her delightful scene." Yep, pairing Merry Christmoose and the Jingle All the Way stamp sets is truly charming. MFT Graphic Guru Laina Lamb spotted Anna's CRAZY inventive card on Instagram. 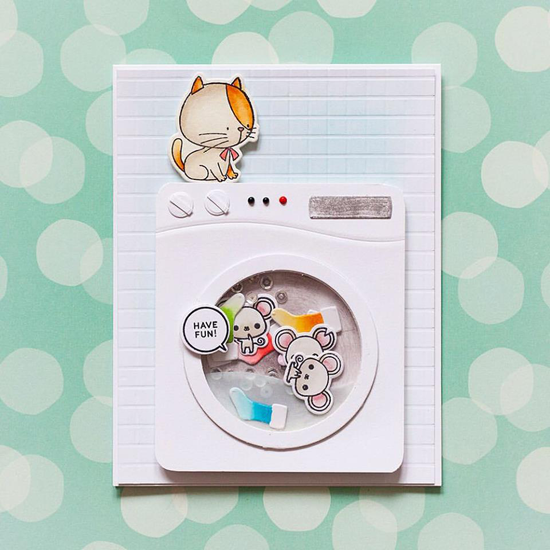 Anna's mind is super creative, and she came up with the idea of creating a washing machine and filling it full of cute mice, stockings, and sequins. She outlines her process of creating her shaker card HERE. I love how the kitty from the I Knead You stamp set is looking on with such interest. HA! Thanks for using MFT, ladies! You've left us inspired, and that's what it's all about! See you tomorrow for the next Sketch Challenge, and look for a new MFT Color Challenge on Thursday, December 24th, Christmas Eve! I am so flattered that Kay Miller chose to feature my card given that I admire her cards so much. Thank you so much. The Fall Florals set is such fun to use, the card practically made itself! SUPER fun cards, love them all!! So inspiring. And that kitty on the washing machine... getouttatown! I know it's just too much! All of them so unique, creative and amazing! i would like to know; what did Anna use for the mice in the washing machine?